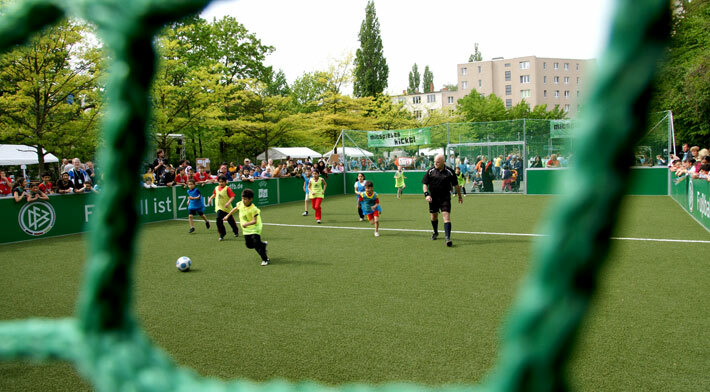 SoccerGround® - The Original DFB Mini Pitch. Built more than 1,000 times, played on more than 1,000,000 times – and every time a winner. “When I think of soccer, I think of warm, sunny afternoons in the cool, grassy hollow opposite my parents’ house, something like a park, where, on one such afternoon, I scored a rare hat trick – unusually for me, as I was a defender, an old-fashioned centre half. But now is now, and now is different. Now the game is played on mini soccer pitches. SoccerGround is now. SoccerGround is Small Sided Football. SoccerGround is played with rebound boards. 266 square metres of pure football. Not kicking around tin cans, pebbles from the river or anything else. This is still very much soccer where it belongs, where the kids are, teenagers, players of all ages. The game is everything. And the game is everywhere! One thousand times in Germany. The second official mini soccer field after the normal size pitch. USP is a specialist for outdoor and indoor mini sports arenas. Our extensive service covers all aspects of planning, construction, assembly and installation of the apparatus. In addition to the playing field systems, our comprehensive array of accessories includes netting, lighting and seating or grandstand facilities. Components are manufactured at our base in Hennef, Germany. Our pitches can be fitted out with one of a broad range of surfaces to meet your individual requirements. Please download our newest product folder here. SoccerGround Advanced @ Olympic Stadium in Berlin.